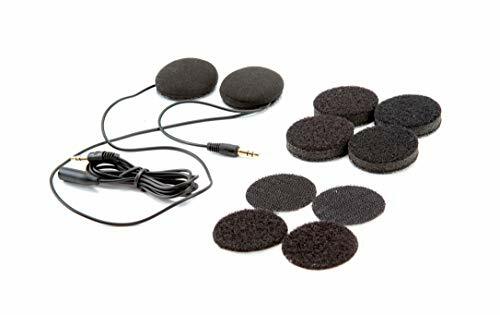 Looking for an audio solution to your motorcycle helmet? I laughed when I saw the other online guides for motorcycle earbuds. You can tell they’ve never worn a motorcycle helmet before! But that’s beside the point, luckily you’ve found someone who has actually suffered through the problem of finding earbuds that fit comfortably inside a helmet. Let’s be honest, it’s not easy finding headphones that fit nicely inside a helmet while having enough sound isolation to cut out a motorcycle. The average motorcycle emits around 85-88 dB of noise when at idle. So you can expect upwards to 90-95 dB when driving. This is a lot for your average headphone to handle! It’s also why it’s incredibly important that you pick the right ones. That level of noise exposure can do permanent damage to your ears if you aren’t careful. A $30 pair of headphones is just going to be a waste of money. But let’s not get ahead of ourselves, a few explanations are in order before we get to the top picks. Here’s a table summary for anyone who’s in a rush. Designed Specifically For Motorcycle Helmets? I’m required to do an annual hearing test for work each year. 2 years ago I started to notice I wasn’t doing so well on the tests anymore. I was actually devastated when I saw that I had permanent hearing loss in my left ear. I mean, it’s permanent! Now that I’m getting older I’m becoming very protective with my hearing. And you should be too! As I was doing research for this article one thing surprised me the most: the majority of noise associated with riding doesn’t come from the motorcycle itself. In fact, wind noise over 35 mph accounts for 90% of the total noise. But what kind of levels are we talking about here? The maximum OSHA Exposure time is the average time you can be exposed to that level of noise before you start to experience hearing loss. What’s worse, noise levels can climb to upwards of 110-116 dB at 65 mph! So if you were to follow the above chart you should limit yourself to 15 minutes at most on the highway. Now you may be thinking ‘people ride on the highway all the time without losing their hearing.’ That’s correct, but everyone is taking some level of precautions. Some of you may be relying on your full face helmet to do most of the legwork here. But, I’m sorry to tell you that studies have shown that, at best, they only provide a 3-5 dB reduction in sound reaching the rider’s ears. So what’s the solution? -> Earplugs! So if you were to use the chart above, a 33 dB earplug in combination with a full face helmet should have you sitting around 72 dB. Before you actually go out and buy a pair of earbuds it’s a good idea to check if your state allows you to wear them. Different states have different rules and regs concerning wearing earbuds while driving a motor vehicle. 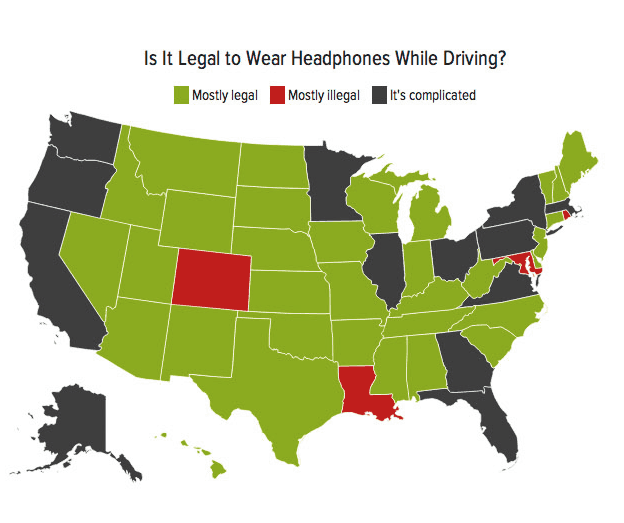 In some states, wearing headphones is perfectly legal; in others, it’s 100% illegal; and in many states, the law is a little less clear-cut—for example, in some states, it’s only legal to wear headphones in one ear, but not two. A majority of the consumer earbuds out there aren’t concerned with noise reduction. It’s just too expensive for the average entry-level earbud. So, trying to use entry-level earbuds as replacements for earplugs is a dangerous gamble. They just don’t have the form-fitting factor or noise damping materials that earplugs use. This means you’re exposing yourself to higher than normal sound levels. It may not seem uncomfortable, but this is usually the most dangerous level of sound for hearing loss. It’s the levels around 85 dB that typically result in long-term damage because you don’t have the feelings of discomfort that inform you something is wrong. While the earbud and full face combo can work, you just have to be very selective on which earbuds you use. Motorcycle helmets have limited capabilities when it comes to reducing wind noise. But, there are still a few tricks we can use to cut down on the noise. I’ll leave skull caps, half-helmets, and three-quarter face helmets aside because there isn’t really much you can do. Full-faced helmets, on the other hand, provide us with a few more options. One of the largest contributors to noise is air flowing through the helmet venting. Some helmets will have lots of venting, while others no so much. Additionally, the venting position and style also have important impacts on wind noise. For example, some helmets may use a single forehead vent, or pairs of eyebrow vents like you see from Arai. In addition to the air being vented into the helmet, there’s also the air moving around the helmet to consider. The better the aerodynamics of the helmet the less noise you will be exposed to. The final way wind noise enters a helmet is through the visor. If you’re unlucky, your visor won’t seal tightly against your helmet. What about those who already have a helmet? Use a chin/neck curtain. This helps reduce airflow from the bottom of the helmet. Stuff fleece behind the cheek pads to make a tighter seal around your face. Some helmets also allow you to open and close vents so you can customize the wind flow into your helmet. So people have also found success by customizing their helmet vents using mesh or foam to block the sound. What About Bluetooth Speaker Helmets? I have a feeling that most of you are already aware of this option, but just in case some of you aren’t. There are full-package options now specifically designed for motorcycles. These helmets include both the speakers inside the helmet, as well as the microphone for Bluetooth connectivity to other riders. The only downside to these helmets is their high-price. But, you may be surprised to find that the helmets may actually be cheaper than buying a set of motorcycle headphones! Remember, you don’t want to be using $30 earbuds as your hearing protection. Some of the helmets already have what we’ll be looking for in our earbuds: active sound canceling. Active sound canceling works by recording the incoming sound and filtering it out before it reaches your ears. The hard part about this technology is fitting it into small headphones. It’s even harder when the headphones are wireless. So why not just purchase a new helmet with the technology already built-in? It’s much easier (also much cheaper) to fit this active noise canceling tech into a helmet versus earbuds. But unfortunately, the reality is this technology is only found in helmets around the $500 mark. The other helmets have no noise canceling and therefore tend to wash out around 45 mph. Let’s take some time to do a comparison between these two options. I know that most of you came here looking for headphones, but I think these helmets are still worth considering. To be honest, this is my first time researching smart motorcycle helmets. I’m actually somewhat blown away. Some of these things are cool! But most of the helmets are exactly what you’d expect. The lowest price I could find for a Bluetooth connected helmet was $189.99. That’s around the higher end for what you’ll find with motorcycle helmet speakers. On the other hand, you can find sets of speakers for around $20. It’s difficult to find out the specs on the built-in speakers in the Bluetooth helmets. Therefore, it’s challenging to provide an accurate comparison on sound quality. But if I were to hazard a guess, the speakers in the helmet would likely be lower quality than some of the speakers you can buy separately. It also wasn’t clear that any of the helmets around the $200 had any type of noise canceling whatsoever. I’m guessing they don’t. A lot of the helmets with built-in speakers I was researching had reported speaker problems above 45 mph. This finding makes me reluctant to recommend this option for anyone looking for music during their ride. This makes me think that this technology still has a way to go before we can buy with any confidence. But you already knew that, didn’t you? You came here for headphones, not motorcycle helmets with speakers. In-ear earbuds are exactly what you’d expect. Just think of any consumer earbud and you’ll have an idea. Headphone inserts, on the other hand, are slightly different. They are basically designed to sit over your ear, or within a cavity in your helmet. See the picture below. Most of the headphone inserts are almost laughable. I use something similar for my skiing helmet and I can barely hear the music. And that’s only at 30 mph! There’s little chance these will work at higher speeds without doing some serious damage to your hearing. But let’s actually give them a chance. First off, headphone inserts are WAY cheaper. These are the ones you’ll find on Amazon for around $30. Similar to the Bluetooth helmets they all have very poor ratings. The most common complaint was the deteriorating sound quality. The headphones had to be turned way up to be heard over the bike, and when they did the sound quality deteriorated to distortion. The only ones that were reputable (for example, this one from Sena) cost between $100-$200. These are the inserts that took advantage of noise canceling technology to overcome the sound issue. The major benefit of this style of headphone is the comfort factor. You probably have experienced the discomfort of wearing earbuds inside of a helmet. They press into your ear and have an annoying habit of constantly falling out. Headphone inserts, on the other hand, stay away from your ears so you don’t even notice they are there. Unfortunately, this extra distance from your ears is exactly what we don’t want in our headphones. There is really no other way to get the sound isolation while still providing decent sound quality. One good thing is they are hard-mounted inside your headphone. This is definitely a convenience factor some of you may appreciate. There was only one set of inserts I’d actually recommend: the Uclear Pulse. I’ll get into why in the review section below. Earbuds seem much more attractive. Buying the correct set of earbuds is usually the more popular route simply because they provide so much more sound isolation. They can act as both an earplug and an earbud (if you purchase the right one) as well as additional tech such as noise canceling. There are also options available that provide Bluetooth connectivity as well as connectivity with a mic so you can talk to fellow riders. The real issue comes down to fit. It’s sometimes painful to fit larger earbuds inside your ears while wearing a full face helmet. A little bit of pressure may seem okay at the start, but 30 minutes into the ride and you’re going to be feeling it. I know some riders like to thread the wiring of the headphones through the padding of the helmet to get the best fit possible. However, this only works if you are using the headphones in conjunction with a comms device. But we still need to be careful when selecting earbuds. We want to make sure we are keeping our ears safe while still being able to enjoy music. This means you will likely have to spend over $100 to get a decent pair. This is why it can be cheaper to buy the all-in-one full-face helmets. Most people tend to use earbuds. They seem to be the best middle ground option we have at the moment. Granted, they aren’t perfect. There are still a number of kinds to work out and a few pitfalls we want to avoid. But they tend to work for most people. What About Headphone Communication Systems? If you know the market well you’ll likely be familiar with Bluetooth communication systems. 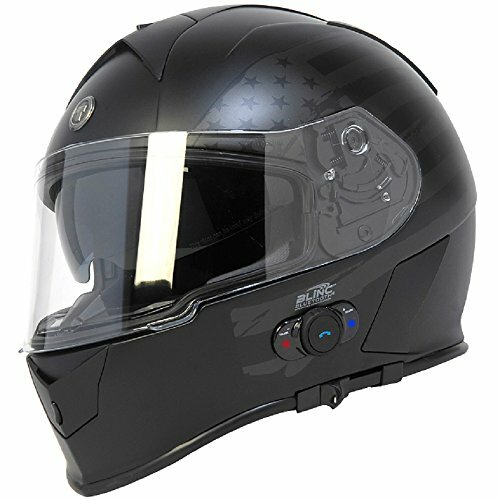 These are purpose-built systems that are designed specifically for motorcycle helmets. From my research, they seem to actually work quite well. You may notice they use headphone inserts, but they also use noise reduction technology. This seems to overcome the issue of sound quality or noise pollution, in most cases. It also comes with a built-in communication and control system. The device attaches to the outside of your helmet so you can control it while you are still riding. It’s kind of hard to tell whether each device will allow you to connect to external headphones or not. I know that the SCALA Q3 definitely does and is what I recommend you tryout if you’re going with the earbud option. Most of them look like the headphones are wired into the device. Meaning it doesn’t allow you to use your own. But with the noise canceling function it should be completely fine for listing to music. Most of the reviews say that hearing the music wasn’t a problem as long as you were able to keep the wind noise down. So people with full-faced helmets didn’t have an issue, but those with an open face helmet weren’t able to hear the sound at higher speeds. These devices have something that our headphones don’t – the ability to communicate with other riders. If you take a look, you’ll notice that every system comes with a mic that sits inside your helmet. With the right device, you will be able to communicate up to 2 km with other riders. Something that just isn’t going to be possible with headphones. The only real downside is the price. Expect to pay around $200 for something reputable. A decade ago, I would have told you that wired headphones were the only reasonable option. Today, however, wireless technology is almost seamless. But what’s better when it comes to motorcycle helmets? I know I can’t speak for everyone, but wearing wire headphones in a helmet is very annoying. I find the wire is always pulling on the headphones which means I have to adjust them in my helmet. It gets frustrating when I finally get the headphones where I want them only to have them yanked out of place. For this reason, wireless headphones have a huge advantage. Once you have them set there is little risk of them being pulled out of place. The only real downside is they have limited battery life. But even so, modern earbuds can usually last for up to 10 hours per charge. Does this mean all wired earbuds won’t cut it? Not necessarily. If you have a comms system where you can plug your earbuds into then you can essentially purchase any set of earbuds you’re happy with. You’ll want to wrap the extra cable length into the padding of your helmet so it’s not hanging loosely around your shoulders. It’s also possible to use just the wired headphones with your phone in your pocket, but for the reason I mentioned above it’s not always the best idea. Now that I have a pair of active noise canceling headphones I don’t think I can go back. It makes listening to music in public places so much more enjoyable. Also, you don’t have to play the music at the same volume as you would otherwise. But do they work on the bike? It’s a good question. First, for those who don’t know, let’s quickly cover how active noise canceling works. On every set of active noise canceling headphones there will be microphones. The microphones record the incoming sound, reverse it, and play it back at an equal and opposite volume. This new sound wave destroys the incoming sound wave before it reaches your ear. Ingenious right!? And the best part is, it actually works! While it’s not perfect, you will definitely notice a reduction in volume of your external environment. They work best for noises that are constant background noise (like a jet engine, or bike for example.) So, no, you can’t use them for hearing protection at the rifle range. Back to the question – do they work well for motorcycles? Most reports say yes! But there is one caveat. You must keep the mics away from the wind. The microphones within the headphones will pick up the wind as if it were noise and just play it back to you just in reverse. The effect of this is you will be listening to your music as if there was a hurricane in the recording studio. No one wants that. You also want to be careful about where the processing unit is. If you’re using a comms system, you won’t be able to use any headphones that have the processing unit close to the male headphone jack. I bet you’re wondering when I’m going to actually start talking about specific headphones right? Well, here we are! I’m not rich, so I can’t really afford to purchase 5 different sets of headphones. But, I am good at research. So I’ve gathered a list of the 5 most recommended headphones from the motorcycle community. Most of the research was done on forums and a little bit of YouTube. If you have any other suggestions, please leave them in the comment section below! Now, to the headphones themselves. 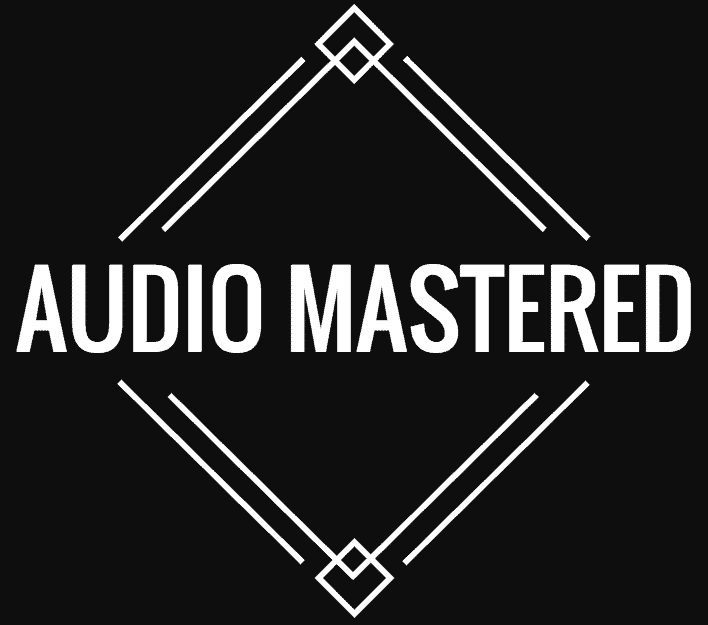 The MEE audio M7 Pros are actually a musician studio monitor. MEE designed these headphones for drummer and bass guitar players. 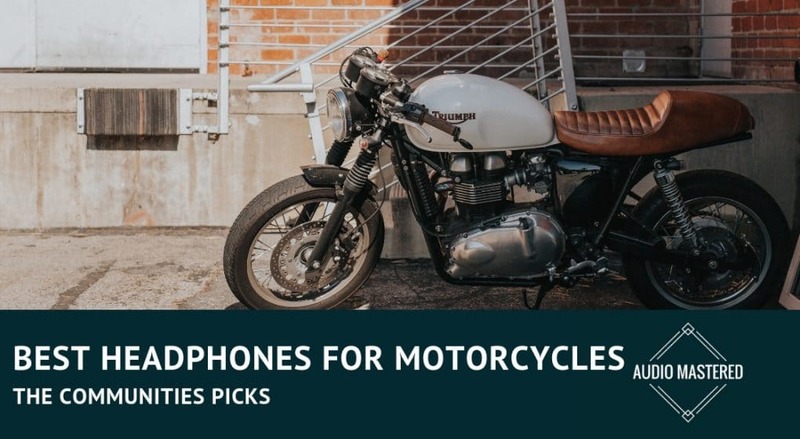 This is why they actually make the perfect headphones for motorcycles – they are designed for loud environments! So much so in fact that they can almost be worn as replacement earplugs if you don’t have any on hand. If you’ve ever sat behind a drum kit or played any instrument onstage for that matter, you know how deafening it can be. That’s why these headphones have been designed to passively cut out as much noise as possible. They use the trademarked Comply foam tip for maximum sound isolation. You can see the frequency response below. Perfect for loud environments. Flat frequency responses aren’t always king in headphones. A little boosting here or there can really make a pair of headphones standout – which is the case here. The dual driver is also a nice addition. 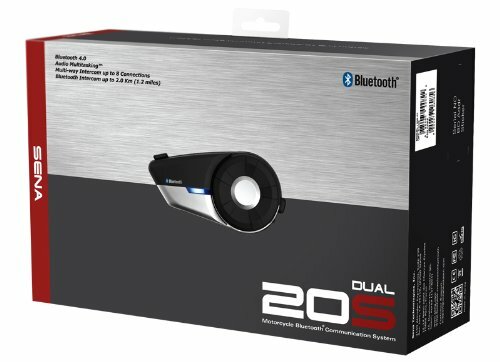 Dual drivers are usually found in headphones above the $300 mark, so it’s a bonus to find them here. Remember how there are always two cones on a typical speaker? Usually called the woofer (for the large cone) and tweeter for the smaller. Well, most speakers use some kind of crossover to split the audio signal into two. The higher frequencies go to the tweeter, while the lower frequencies go to the woofer. The end result is a clean, balanced sound profile because one cone isn’t trying to play both the highs and the lows at the same time. Well, the same thing goes for dual driver headphones. It’s actually amazing that this technology has found its way into earbuds. I was surprised when it first showed up in over-ear headphones! See the diagram below for a graphical illustration of the technology. The end result is a crisp, well-balanced sound profile. The bass is thick without being too muddy and the treble is crisp and clear. One of the best profiles on my list. This makes these a great headphone for anyone who appreciates the subtleties in music and want a fully immersive experience. If that’s not you, then skip these and move on to the less expensive options below! 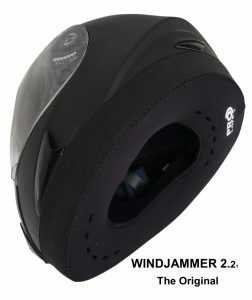 Because of the ear tip design, you won’t have to have any further ear protection for riding on your bike. Bonus! Because these are musician monitors they are designed to take a beating. They have one of my favorite features in earbuds – removable cables. This way, if your cables end up shorting out (which is one of the most common ways headphones stop working) then you can simply replace them with the provided spare cable! My major complaint is the lack of active noise cancellation. However, these headphones paired with a Bluetooth comms system is almost an unbeatable system! One of the only drop-in headphones that actually gets recommended. This recommendation also comes from FortNine and can be seen in the video above. As I’ve said above, these types of headphones aren’t always the best option. Especially if you are riding a particularly noisy bike with a poor amount of acoustic protection. You’ll be happy to note they are much cheaper than almost every other headphone on the list. Sound quality is almost always directly related to price. So if you are someone who doesn’t really care about how the audio is represented in your headphones and just want something to listen to then these may be the best option for you. That being said, the sound quality isn’t terrible. The average listener won’t have anything to complain about. It’s reported the treble is a little boosted, and the bass is somewhat lacking, but the overall sound quality is there. As you can see from the picture above, they usually sit nicely inside full faced helmets. That’s actually the major benefit to this style of headphone – ease of use and comfort. There aren’t any earbuds pushing uncomfortable into your ears, or anything falling out of place during the ride. No constant adjustments needed. Just set up, plug in and go. Most Bluetooth comm systems use this style of headphone. So if you’re wanted a completely hands free experience, that could be a good option. Something interesting to note is the 40 mm driver size. This is actually what most over-ear headphones use. From this alone, you can expect the volume to get pretty loud (not always the best thing if you’re trying to drown out wind noise.) They come with velcro helmet mounts, which makes installing them in your helmet a breeze. I don’t really have anything negative to report about these – only that they may cause greater hearing damage of the long run. Most reports say that they were loud enough while still allowing you to hear your bike. The Bose QuietComfort 20 were the most recommended option for earbuds inside motorcycle helmets. Both in forums, other blog posts, and on YouTube channels. Unfortunately, they’re not cheap! If you can afford to invest in a good set of earbuds then these are the way to go. They have been the most successful across the board with many people saying they were the best investment they made when it came to hearing protection while riding. 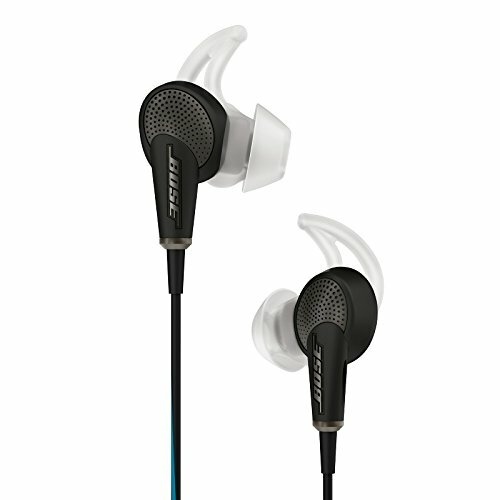 The main difference between the Bose and other headphones is the active noise canceling technology. As I mentioned before, this style of headphones records the sound around you, reverses it, and plays it back into your ears to destructively cancel any background noise. The only type of noise these headphones do a good job of canceling is constant background noise. One of the biggest supports of QuietComfort 20 is from Chris from Chris On The Street. Check out his video recommendation below. As he mentions in the video, the only drawback to using active noise canceling tech is a weird popping noise that can occur if there is a blast of air passing through your helmet. As he mentions, it only happens on rare occasions. He also uses the earbuds with his comms system, something most people recommend you do. It just makes everything that much easier. Plus, you can just set up your earbuds inside your helmet and don’t have to worry about adjusting them everytime you want to ride. One major consideration when using a comms set up with active noise canceling headphones is the waterproofing. You notice some sets of earbuds will have the noise canceling processor on the earbud line itself (as opposed to built in the earbud.) This can be very problematic when it comes to motorcycle headphones! 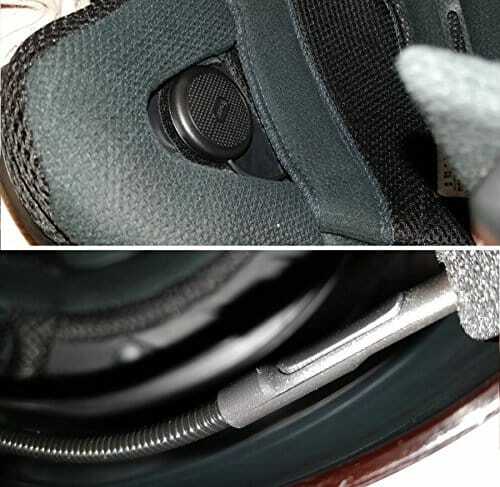 If there is no way to hide the processor inside your helmet you may have issues with shorting out your headphones. Unfortunately, Bose has placed the processes in an inconvenient place. So much so that I would not recommend these headphones to anyone who wants to ride in the rain if you plan on using a comm system! If you are just going to plug the headphones into your phone you won’t have any issues. You can see Chris putting on the headphones under his helmet in the video. In terms of sound quality – these headphones almost get a 5 star. Some audiophiles may be cringing a little, but for the average listener, these headphones are going to be mind-blowing. Plus, you’re also getting the added protection of noise canceling! One of the more recent up-and-comers – Slimbud helmet earbuds. They may look stupid, but their functionality is exactly what we’re looking for. They are actually specifically designed for motorcycle helmets! They score high marks on everything I discussed above. As such, they are my number 1 recommendation for motorcycle earphones! The casing of the earbud is designed to be slim enough that it doesn’t protrude outside of your ear. 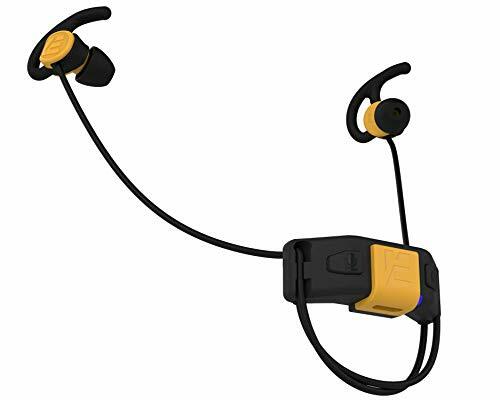 SECURE FIT UNDER ANY HELMET: The slim design and silicone ear hooks allow these headphones to be worn under any helmet - whether half, three-quarters or full face - without falling out or being pulled out of your ears. No more fighting with annoying ear buds. VERSATILE WIRELESS HEADPHONES: Whether you're cruising on your bike down the coast or walking to the store, these headphones are practical for everyday use, with or without a helmet. Each pair of SlimBuds comes with (3) different size silicone earbuds, (3) different size foam ear-hooks, USB-charging cable and carrying-case. I know, the chinstrap looks weird, but it’s actually pretty functional. Not only does it keep the earbuds securely locked in place, but the chin mic also allows you to communicate to your fellow riders without having to deal with wind noise. You communicate with your fellow riders through a mobile app. The obvious downside is you need to have multiple riders using the same system. The earbuds are designed to sit snuggly into your ears to provide you the passive noise protection you’d be getting with earplugs. They come with a range of different ear tips so that you can customize them to different ear sizes and shapes. While not at the same level as Bose, the sound quality of the Slimbuds is actually quite good. They use a micro balanced armature to deliver crisp treble and deep bass. And because they are sitting directly in your ear, they won’t be working hard to compete with wind noise or noise from your bike. The only thing missing with these headphones is active noise canceling. But, because they are essentially wireless, this would be difficult to achieve while still keeping a thin profile. That another thing these headphones have going for them – they are wireless! That means no more yanking out of the headphone if you accidentally pull on the cord! The downside to this is you’re going to be limited with battery life. Meaning these might not be the best option if you’re prone to venturing on 10 hour long-distance rides. It can also be a pain if you’re touring and staying in a tent. But if you just want something for around town then this won’t be an issue. There is also a remote coming out soon that will allow you to control the headphones without having to look at your phone. This feature is much needed as you don’t want to have to pull your phone out of your pocket to take a call or change the song. I don’t really have anything bad to say about these headphones. Go and check out the reviews on Amazon for yourself. They almost have a perfect 5-star rating. The final headphones on my list – ruckus earplug earbuds. These headphones are for those who don’t want to spend more than $50 on a new set of headphones. They are also for those who are concerned with hearing protection while riding. 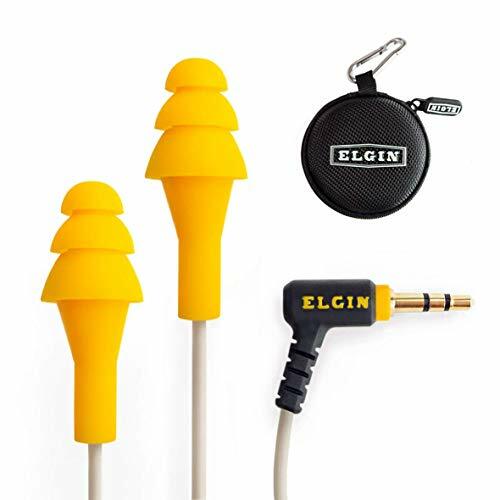 They are some of the only earbuds around that can act as earplugs as well as earbuds. These actually are recognized by OHSA to meet ANSI standards. One of the rare few. They reduce the volume by 25 decibels – which should be enough as long as you’re not exposing yourself to extreme noise over long periods of time. Don’t expect too much sound quality wise from these headphones. They are designed to be used on construction sites as a stand-in for earplugs. The sound quality won’t be bad, but it won’t compare to the Bose of the Slimbuds above. The good news is because it’s blocking out a lot of noise interference, you may find the sound quality better than the UCLEAR drop-in speakers. They’ve put some thought into the quality of the material used. 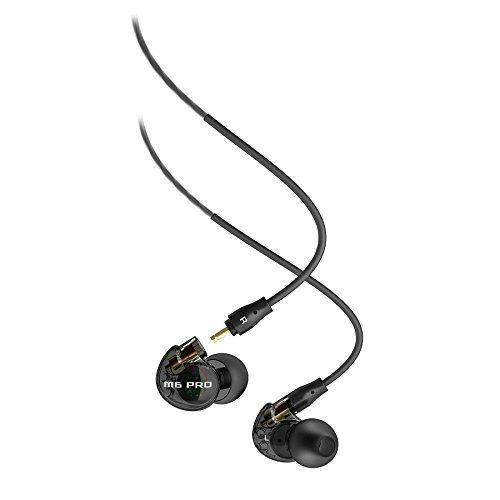 They use a double molded junction and audio jack, reinforced TPE wire jacketing, and triple-sealed driver. In other words, they are designed for the construction site. All of these features are designed to increase the durability and lifetime of the headphone. They were also designed to be as light as possible. It’s not a deal breaker, but I’ve always appreciated the feeling of lightweight headphones. This typically means there has been some sacrifice in sound quality, although it’s not always the case. One of the main reason I’d purchase these is if I was planning on using them for other work around the house. For example, they’ll be a great headphone for mowing the lawn or using power tools. They’re lightweight and durable – what more could you ask for at this price point? Of course, you’re still going to have to deal with the cord issue, but because they don’t have any sensitive electronics like the Bose headphones, there shouldn’t be anything to worry about if you’re connecting them to the comms system. The best headphone isn’t going to be the same for everyone. Each person is going to have a unique set up, budget, and preference. Each of the headphones on the list will work well. Just remember that it’s not always easy to tell when you’re doing enough damage to cause hearing loss. It’s much better to be on the safe side and protect your hearing as much as possible. Also, make sure you’ve double checked your state laws. If you can’t ride with earbuds in then play it safe and purchase the UCLEAR, or at least purchase the wireless Slimbuds so you don’t have an obvious wiring hanging down from your helmet. As usual, there are 100s of different headphones available and I may have missed a few, or didn’t include one of your favorites. If this is the case, please just leave your suggestion in the comment section below. I’d also like to thank everyone in the forums I came across while doing the research. This is sometimes the best way to find out what’s actually working.